The Minister of Transport hereby publish for comments the regulations contained in the Schedule, in terms section 34 of the Administrative Adjudication of Road Traffic Offences Act, 1998 (Act No. 46 of 1998). Interested parties are invited to submit written comments on the draft regulations to reach Ms Siya Wotshela at Private Bag X147, Pretoria, 0001, or at SiyaW@rtmc.co.za within 30 days from the date of publication of this notice. The Minister of Transport has, under section 34 of the Administrative Adjudication of Road Traffic Offences Act, 1998, made the regulations in the Schedule. (d) “the Act” means the Administrative Adjudication of Road Traffic Offences Act, 1998 (Act No. 46 of 1998). 2. The administrative functions of the Agency that arises as a result of infringement notices to be issued, representation to be made by the infringers and allocated to the representation officers, courtesy letters, enforcement orders, warrants, service of notices and other administrative functions concerning the recording of information, reception and dispatch of mail, as approved by the Registrar, shall be executed by the Corporation on behalf of the Agency: Provided that the Corporation shall not provide any service to the Agency that entails that it shall execute any discretion or decision on behalf of the Agency. (b) by registered mail, on a form similar to forms AARTO 03 and AARTO 04 as shown in Schedule 1, within 40 days of the commission of the infringement. (iii) the name of the issuing authority at which he or she is employed. 4. (1) Subject to regulation 2, the representations contemplated in section 18 or 19(2)(b)(i) of the Act, must be submitted to the agency on a form similar to form AARTO 10 as shown in Schedule 1, in the manner contemplated in regulation 23(1)(a) and the infringer must keep a copy of such representation. (2) Subject to regulation 2, the agency must within seven days from the date of receipt of representations, acknowledge the receipt of such representations on a form similar to form AARTO 11 as shown in Schedule 1, in the manner contemplated in regulation 23(4). (4) The manner in which the representations officer must inform the issuing authority concerned that a representation indicating reasonable grounds why the infringer should not be held liable have been received, as contemplated in section 18(4)(a) of the Act, is by a notification made in terms of regulation 23(2). (5) The issuing authority shall reply to the representation received in terms of regulation 4(4) within 14 days of receipt of such representation from the Agency. (6) Subject to regulation 2 , the manner in which the issuing authority must give notice to the agency in terms of section 17(2) of the Act, that an infringer has failed to comply with an infringement notice within the period contemplated in section 17(1) of the Act, is to submit an electronic data file on which the information known in respect of the infringer and the infringement appears, to the agency in accordance with regulation 23(1), within such period, not exceeding 32 days, as may be agreed upon between the issuing authority and the agency. (7) The information that must be provided on the electronic file, as contemplated in subregulation (6), is set out in Schedule 5. 5. Subject to regulation 2, the manner in which the agency must inform an infringer of the decision of the representation officer in respect of his or her representations, is by providing the infringer with a properly completed form similar to forms AARTO 12, AARTO 13 or AARTO 14, as applicable, as shown in Schedule 1 in accordance with regulation 23(3). 6. Subject to regulation 2, the agency shall issue a courtesy letter in terms of section 19(1) of the Act, on a form similar to form AARTO 17 as shown in Schedule 1 and within such period, not exceeding 32 days, as may be agreed upon between the authority and the agency, after receipt of the notice contemplated in subregulation 4(6). 7. (1) The Registrar shall issue an enforcement order as contemplated in section 20(1) of the Act on a form similar to form AARTO 18 as shown in Schedule 1. 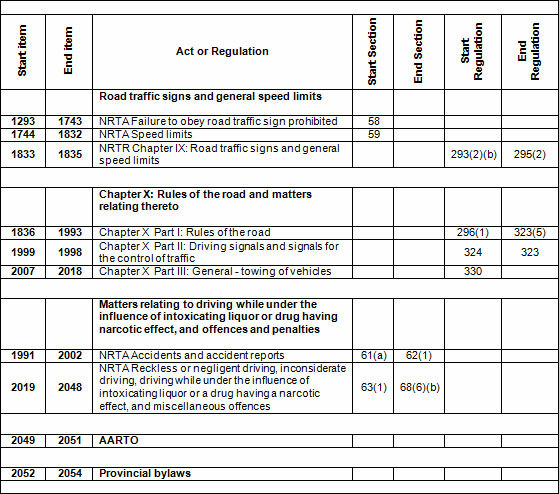 (2) Subject to regulation 2. the manner in which the agency must notify the infringer, as contemplated in section 20(1)(c) of the Act, that demerit points have been recorded on the national contraventions register, is by means of a properly completed form similar to form AARTO 32 as shown in Schedule 1. (c) a certified copy of the infringer’s bank statement, if payment was made by debit order, cheque or electronic transfer. (4) Subject to regulation 2, a registering authority or driving licence testing centre must, within such period, not exceeding 32 days after the date on which payment was received, notify the agency in terms of section 20(8) of the Act that it has received payment contemplated in section 20(7) of the Act, by providing the agency with an electronic data file on which particulars of the said payment appears. (5) The manner in which an infringer may apply to the agency for the revocation of the enforcement order as contemplated in section 20(9)(a) of the Act, is by submitting a properly completed form similar to form AARTO 19 as shown in Schedule 1 to the agency in accordance with regulation 23(1)(a). (6) The agency must, within 21 days from the date of receipt of an application contemplated in subregulation (5), notify the infringer of the result of the application on a form similar to forms AARTO 21, AARTO 22, AARTO 24, AARTO 25, AARTO 26 or AARTO 27, as the case may be, as shown in Schedule 1. (7) The manner in which an issuing authority may apply to the agency for the revocation of the enforcement order as contemplated in section 20(9)(b) of the Act, is to submit to the agency in accordance with regulation 23(1)an electronic data file on which the reference number of the infringement notice, the particulars of the infringer and the reason for the application appear,. (8) The agency must notify the issuing authority contemplated in subregulation (7) of the result of its application, by submitting such result on an electronic data file to the said issuing authority, within 21 days from the date of receipt of an application contemplated in subregulation (7). (iii) only be executed against movable property of the infringer in accordance with the terms of the warrant. (iv) in the case of a warrant contemplated in section 21(1)(e), by immobilizing the motor vehicle that is mentioned in the warrant and of which the infringer is the owner or registered operator, in the manner set out in the warrant. (c) shall only cancel the said inventory once the bank cheque is honoured. (b) as contemplated in section 18(7)(c) or 19(2)(b)(iii) in of the Act, is by properly completing a form similar to form AARTO 17 or after the notification of the result of the representations a form similar to form AARTO 13, as the case may be, as shown in Schedule 1, and submitting the said form to the agency in accordance with regulation 23(1)(a), subject to regulation 2. (b) reflect the street address where the infringer will accept service of process, notices or documents, as well as confirmation of the infringer’s postal address. must notify both the agency and the issuing authority in terms of section 22(2)(a) of the Act, by providing the agency and the issuing authority in accordance with regulation 23(1) and (2) respectively, with a properly completed form similar to form AARTO 16 as shown in Schedule 1. 10. 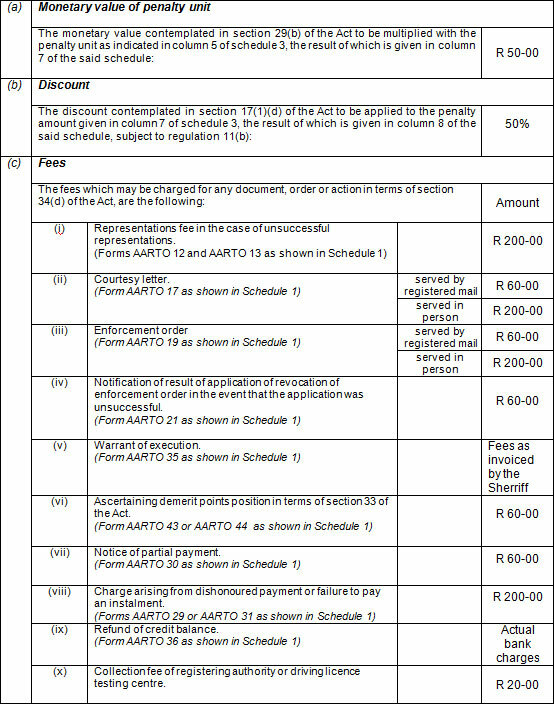 (1) The penalty contemplated in section 29(b) of the Act, which is payable in respect of an infringement mentioned in columns 3 and 4 of Schedule 3 is calculated in accordance with the penalty units set out against it in column 6 of Schedule 3, where each unit has a monetary value as described in paragraph (a) of Schedule 2. (2) The penalty amount payable in respect of an infringement mentioned in columns 3 and 4 of Schedule 3, calculated in accordance with subsection (1), is set out against it in column 8 of that Schedule. 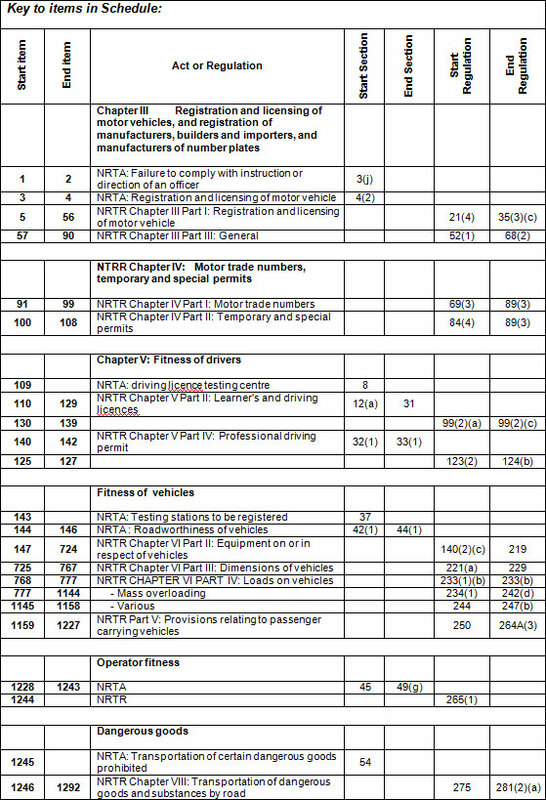 (3) Except for an operator, no demerit points will be allocated to an infringer who is a juristic person, but the penalty will be calculated on the basis of three times the units indicated in column 6 of Schedule 3 against the infringement concerned mentioned in columns 3 and 4 of that Schedule. 11. (1) (a) Subject to paragraph (b), the discount contemplated in section 17(1)(d) of the Act is set out in paragraph (b) of Schedule 2. (b) An infringer who holds a foreign driving licence or an international driving permit shall not be entitled to any discount as set out in Schedule 2 and shall be liable to pay the full amount as reflected in Schedule 3. (2) The discount amount deductible in respect of an infringement mentioned in columns 3 and 4 of Schedule 3, calculated in accordance with subsection (1), is set out against it in column 9 of that Schedule. 12. (1) The fees which may be charged for any document, order or action required to be issued, made or performed as contemplated in section 34 (d) of the Act, are set out in paragraph (c) of Schedule 2. (b) an enforcement order, if the infringer provides proof that he or she has paid the penalty on or before the date on which the enforcement order was issued. (d) by means of an electronic transfer to the bank account indicated on the infringement notice as referred to in paragraph (a) and the infringer shall be responsible to ensure the correct reference number, as indicated on the infringement notice, is used for the electronic payment. (2) Post dated bank cheques shall not be acceptable. (b) is regarded as an admission of guilt by the infringer and shall results in the demerit points prescribed in Schedule 3, being incurred by the infringer. (c) to an agent as contemplated in regulation 14(1)(c), the agent must issue a receipt directly to the infringer, whereafter the agency must provide the infringer with a printout contemplated in section 17(3)(d) of the Act, on a form similar to form AARTO 32 as shown in Schedule 1, within 32 days of receipt of payment, and subject to regulation 2 . (ii) notify the agency of such payment, and that a courtesy letter must not be issued for such infringer. (d) means of an electronic transfer to the bank account indicated on the courtesy letter or enforcement order. (2) Any payment of the penalty and fees to the agency, which payment includes a partial payment, dishonoured payment and an application to pay in installments, is regarded as an admission of guilt by the infringer. (ii) means of a cash or bank cheque deposit directly into the agency’s bank account, particulars of which are obtainable from forms AARTO 05, AARTO 07, AARTO 12, AARTO 16, AARTO 17, AARTO 18, AARTO 29 or AARTO 30 as shown in Schedule 1. (4) If a payment to the agency is made in the manner contemplated in subregulations (3) or (9), the infringer must ensure that the infringement notice number appears on the deposit slip, debit order or stop order instruction of any payment completed at a bank contemplated in the said subregulations. (5) If the infringer provides an incorrect number on the deposit slip, debit order or stop order instruction as contemplated in subregulation (4), and such incorrect number results in the issuing of an enforcement order or warrant, whichever is applicable, by the agency, the infringer shall be liable to pay any extra administrative cost. 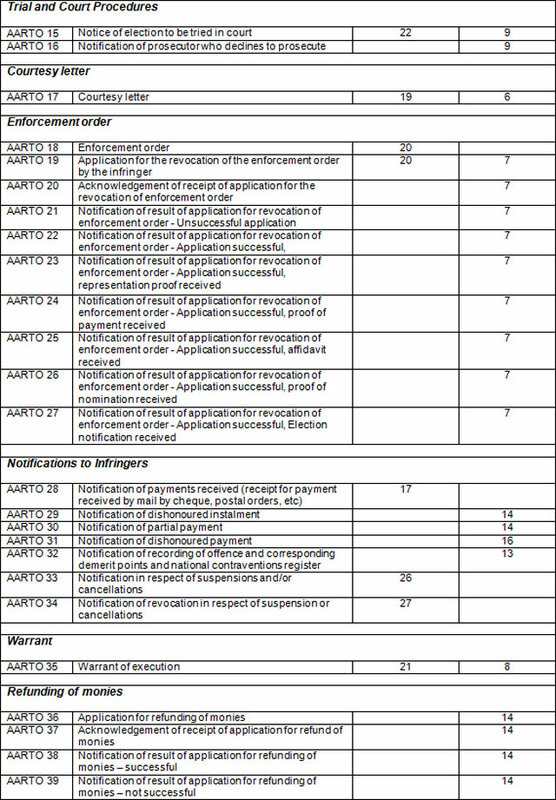 (6) If payment of the penalty contemplated in subregulation (1), was received before an enforcement order was issued, the agency must, subject to regulation 2, notify the infringer on a form similar to form AARTO 32 as shown in Schedule 1, that the demerit points have been recorded against his or her name in the national contraventions register in respect of the infringement in question. (7) Subject to regulation 2, the manner in which an infringer may pay a penalty in installments as contemplated in section 17(1)(f)(iii) of the Act, read with section 34(e) of the Act, is by applying to the agency, on a form similar to form AARTO 06 as shown in Schedule 1, to pay the penalty and fees in instalments. (ii) the fact that the demerit points will be recorded against his or her name in the national contraventions register in respect of the infringement in question on a form similar to form AARTO 32 as shown in Schedule 1 on receipt of the first of such installments. 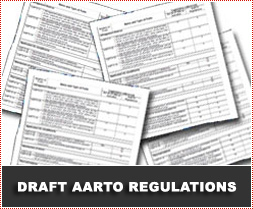 particulars of which are obtainable from the infringement notice, form AARTO 01, AARTO 02, AARTO 03, AARTO 04 or AARTO 07 as shown in Schedule 1. (dd) such notification is regarded to be equivalent to an enforcement order, issued under section 20 of the Act. (a)In the case where an infringer is of the opinion that he or she has paid more than the prescribed penalties or fees, he or she may apply for the refund of such penalties or fees on a form similar to form AARTO 36. (b) The agency shall acknowledge receipt of the application referred to in paragraph (a) on a form similar to form AARTO 37. (c) The agency shall consider the application and shall refund the penalties and fees or refuse the repayment, as the case may be, and shall notify the applicant on a form similar to form AARTO 38 or 39, as applicable. 15. (1) The manner in which any payment of a penalty and fees must be made by an infringer to any registering authority or driving licence testing centre in terms of section 20(7) of the Act, read with section 34(e) of the Act, is by paying the cash amount or by paying with a bank cheque, in person at such registering authority or driving licence testing centre. (b) is regarded as an admission of guilt by the infringer. (3) The registering authority or driving licence testing centre that has received payment in terms of subregulation (1) and (2) shall issue a receipt directly to the infringer and notify the agency electronically. (4) If any payment of a penalty or fees contemplated in subregulation (1) is dishonoured, the registering authority or driving licence testing centre concerned must notify the agency in the manner contemplated in regulation 22(1), and the matter must be dealt with in the manner contemplated in regulation 15(2). 16. (1) If a payment of a penalty contemplated in regulation 13(1), is dishonoured, the issuing authority concerned must notify the agency in the manner contemplated in regulation 6(1), where after the matter is dealt with in the manner contemplated in subregulation (2). and such notification is regarded to be equivalent to an enforcement order, issued under section 20 of the Act. 17. Where provision is made in terms of this Chapter for a period within which an application or payment must be made, such period must be construed as a period of grace allowed to the infringer, during which period he or she may make such application or payment without being liable for any further administrative penalties. 18. (1) A person who has personally served an infringement notice must return the copy of such infringement notice to the issuing authority where the contents of such notice must be recorded on the national contraventions register, and it must be verified whether it has been complied with within 32 days. (2) If an infringement notice is served by registered mail, the issuing authority must, for the purposes of section 30(2) of the Act, keep the receipt issued by the post office that accepted the notice for registration. (3) Each issuing authority, registering authority and driving licence testing centre must retain records of all transactions executed by it in terms of the Act. (5) The manner in which record must be kept of payments received and receipts issued, is by electronic image, until the time the record is disposed of as contemplated in regulation 19(5). 19. (1) The manner, in which any information regarding any offence or infringement is to be recorded in the national contraventions register, is by an electronic file. (2) The manner, in which the national contraventions register must be updated as contemplated in the Act, is by transferring an electronic data file from the issuing authority or agency to the national contraventions register. (b) update the said record regularly. (4) The agency must keep record of all the cases which were referred to the court for appeal or review in connection with the demerit points recorded against a person in the national contraventions register, as well as the outcome of such cases. (b) the authenticity of the electronic image of such document has been certified by the agency. (a) Any electronic image of a document which has been certified by the agency as a true image of the original document is deemed to be the original document for the purposes of criminal proceedings, unless evidence to the contrary is adduced. (b) Any person, who, under paragraph (a), certifies any image as true knowing that such image is false, is guilty of an offence and liable on conviction to a fine or imprisonment for a period not exceeding two years. 20. (1) Personal service is achieved when the document to be served, is delivered to an infringer identified in the document, in person. (2) If the infringer identified in a document is served in person, he or she must accept the document on the request of the person who serves it. (3) An infringer who fails to comply with subregulation (2) is guilty of an offence and liable on conviction to a fine or imprisonment for a period not exceeding three months. (c) section 20(3) of the Act, if an enforcement order is served. (b) sign the document and request the infringer to sign the document: Provided that in the event that the infringer refuses to sign the document, the person serving such document must indicate that on the document: Provided further that the fact that the infringer refused to sign the document shall not affect the validity of such service. (6) A signed document referred to in subregulation (5), is prima facie proof that the notice, letter or order concerned was duly served. and for the purposes of this subregulation, when a building other than a hotel, boarding house, hostel or similar residential building, is occupied by more than one person or family, “place of residence” or “place of business” means the portion of the building which is occupied by the person upon whom service is to be effected. (d) two or more persons in their joint capacity as trustees, liquidators, executors, administrators, curators or guardians, or in any joint representative capacity, the document must be delivered to each of them. (c) address as indicated on a form similar to form AARTO 01 or AARTO 02, as may be applicable, as shown in Schedule 1, which he or she has confirmed as correct. 22. 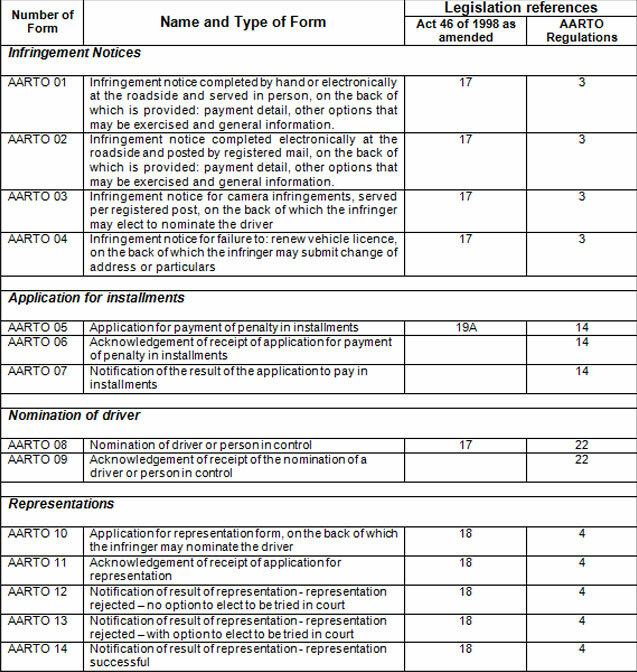 (1) The manner in which the licensed owner of a motor vehicle must provide the information contemplated in section 17(1)(f)(v) of the Act, is by submitting a properly completed form similar to form AARTO 08 as shown in Schedule 1 to the issuing authority in accordance with regulation 23(2). (2) The issuing authority shall acknowledge receipt of the nomination of the driver as contemplated in paragraph (a) on a form similar to form AARTO 9, within a period of 14 days from receiving such nomination. (b) notify the agency on a form similar to form AARTO 08 as shown in Schedule 1, in the manner contemplated in regulation 23(1)(a), if the said acknowledgement has not been received as contemplated in paragraph (a). but affidavits contemplated in regulations 4(1) and 7(4) may only be submitted in the manner set out in paragraph (a). but an affidavit, the form on which the infringer elects to appear in court and the form on which the driver or person in control is nominated, may only be submitted in the manner set out in paragraph (a) or (b). (c) forwarding it to the infringer’s e-mail address. (4) Any acknowledgement to the infringer must be made by posting it to the postal address of the infringer. 24. (1) The demerit points to be incurred in respect of an infringement set out against it in column 3 of Schedule 3 are as set out in column 7 of that Schedule. (2) The demerit points incurred in respect of an operator for infringements set out in column 11 of Schedule 3 shall be as indicated for the infringements charged for under section 49 of the National Road Traffic Act as indicated in Column 11 of Schedule 3. (3) The total number of demerit points which, if exceeded, disqualifies a person from driving a motor vehicle, as contemplated in section 29(d) of the Act, is 12 points. (4) The total number of points that will result in the suspension of the operator cards of an operator shall be as contemplated in Schedule 4. (5) The notice contemplated in section 26(1) of the Act, by which a person must be informed that he or she has incurred more than the number of demerit points referred to in subregulations (3) and (4), must be on a form similar to form AARTO 33 as shown in Schedule 1. (6) An application contemplated in section 25(3) of the Act, to the issuing authority to return a person’s driving licence or professional driving permit as contemplated in section 25(5) of the Act, must be submitted to the issuing authority on a form LL1 or DL1, whichever is applicable, as shown in the Road Traffic Regulations. (1) The manner in which an employee referred to in section 33(2) of the Act may grant his or her written permission to his or her employer is by providing his or her employer with a properly completed and signed consent form similar to form AARTO 40 as shown in Schedule 1. (2) The manner in which an infringer must be informed by any issuing authority, registering authority or driving licence testing centre in terms of section 33(1) of the Act of his or her demerit points position, is by providing the infringer with a detailed statement of every infringement recorded against him or her, on a form similar to form AARTO 41 or AARTO 42, whichever is applicable, as shown in Schedule 1, in accordance with regulation 23(3). 26. (1) These regulations are called the Administrative Adjudication of Road Traffic Offences Regulations, 2007, and shall, subject to subregulation (2), come into operation on 1 September 2007 for the municipal area of Tshwane. (2) Regulation 24, column 7 of Schedule 3 and Schedule 4 shall come into operation on a date to be determined by the Minister by notice in the Government Gazette. Column 11 Operator charge in terms of section 49 of the National Road Traffic Act, 1996 Indication of charge against operator simultaneously to charge against driver. 1. Every motor vehicle, for which an operator card is issued, as contemplated in section 45 of the National Road Traffic Act, 1996, shall be subject to the conditions of this schedule. 2. The total number of points that an operator may incur, shall be in accordance with the number of vehicles owned by the operator. 3. The total number of demerit points, which, if exceeded, shall result in the suspension of the operator cards of an operator, shall be the total number of points given in the table below in accordance with the number of vehicles of the operator. 4. The operator of the drawing vehicle shall be charged, in the case of an infringement committed by a combination of motor vehicles: Provided that the operator of the drawing vehicle may submit representations to the agency, to present reasons to charge the operator of a trailer in such combination in stead of such operator. 5. Every demerit point over the maximum points, calculated in terms of the number of vehicles given in the table below, shall result in a one month suspension of all the operator cards of an operator. (j) nature of juristic person, if applicable. (d) e-mail address, if applicable. (c) his or her cellular telephone number, if applicable. (d) proxy or representative indicator. (h) GPS coordinates, if applicable. (c) name of the authority at which he or she is employed. (d) indication if matter is on appeal or review and result of such appeal or review. (r) payments made to representation officers. (o) payments made to sheriffs. (i) name, surname and infrastructure number of the capturing official.